Starting a new "column" at QuasarDragon where we celebrate the birth of important genre (SF, Fantasy, and Horror) writers and other important dates. Of course, this will also be an excuse to link to great free fiction. 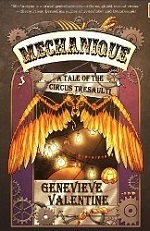 Genevieve Valentine (born July 1, 1981) is an excellent young writer whose first novel won the Crawford Award for a first fantasy novel, and was nominated for the Nebula. For more biographical information visit her website. Be sure to check out some or all of her free stories listed below (likely an incomplete sampling) and if you like what you read/listen to, then grab her novel at Amazon. "Abyssus Abyssum Invocat" at Lightspeed. "A Bead of Jasper, Four Small Stones" at Clarkesworld. "Bread and Circuses" at Beneath Ceaseless Skies. "86, 87, 88, 89" at Clarkesworld. "The Finest Spectacle Anywhere" at Beneath Ceaseless Skies. "86, 87, 88, 89" read by Kate Baker. "A Bead of Jasper, Four Small Stones" read by Kate Baker. "Semiramis" read by Kate Baker. "Seeing" read by Kate Baker. "Advection" read by Mur Lafferty. "Carthago Delenda Est" read by Kate Baker. "29 Union Leaders Can’t Be Wrong" read by Chris Lester. "Study, For Solo Piano" read by Laurice White. "Bespoke" read by Tina Connolly. "Is This Your Day To Join The Revolution" by Genevieve Valentine. "The Sandal-Bride" read by Paul Â Boehmer + Interview.